Write-On / Wipe-Off Premium Plastic Memo Boards - 10 mil. Made from premium plastic so there is no warping with this quality board. Write on surface is a FINN-Line exclusive that will accept non permanent marker and even ballpoint pen. Premium 10 mil. Plastic Write On / Wipe Off Boards. 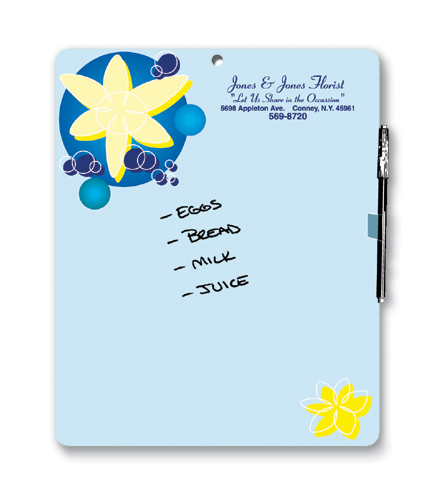 Our Write- On surface is a FINN exclusive that accepsts ball point pen or dry / damp erase markers! Available as 8-1/2" x 11. Round corners included. Adhesive tabs, magnetic tabs, pen clips and special packaging also available! 125 qty.= 7 lbs./ 1,000 qty.= 53 lbs. Production: 5 -10 business days. 40 mil plastic available on product code: KR-40. .Custom sizes and custom shapes available on Kwik-Quote™!